Dusk Till Dawn Casino owner Rob Yong in going into a heads-up battle against Phil Hellmuth with $500,000 at stake! "Hanging out w @PartyPoker Partner Rob Yong in @AriaLV High Limit Bar. We are playing FIVE $100,000 HU matches, who wins? Vote on next tweet !" The poll shows as following: 57%PH vs 43%Rob. And what do you think? Rob Yong considers himself a firm favourite to down his legendary rival, telling HighStakesDB: “I’m confident. 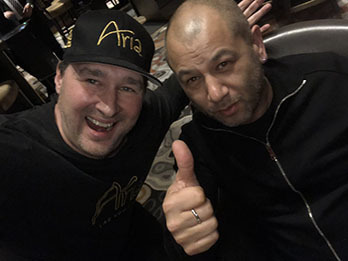 Phil was telling us all how he is the greatest player ever after a few beers in Rio, so I initially offered Phil 6-4 on one Deepstack match or I play all hands on button blind, but he was too proud to accept that and went for best of 5 events." Hellmuth has plenty of experience of heads-up play, even in 2005 he won the National Heads Up Championships, defeating Chris Ferguson in the final, while in 2013 he lost out to Mike Matusow in the same event. Rob Yong’s history is less impressive, but the man has massive experience playing short-handed cash games for the biggest stakes makes for an very interesting match-up. We will keep you informed of the match. Helmuth vs. Durrrr would be more interesting. anyone vs durrr would be more intersting though.